Every organization should have a hierarchy set up for their employees to run day-to-day to work smoothly. Office 365 introducing many advanced features (ex: Office 365 Groups, Flow, Planner ,Teams, and etc.) to reduce the hurdles in collaboration and communication between employees and their manager. So, setting up manager for users is important to use advanced features like Flow and Workflow. In this post, we are going to explain how to update manager field for Azure AD users by following three different ways. You can follow the below steps to set a manager in required mailbox user through Exchange Online Admin center. 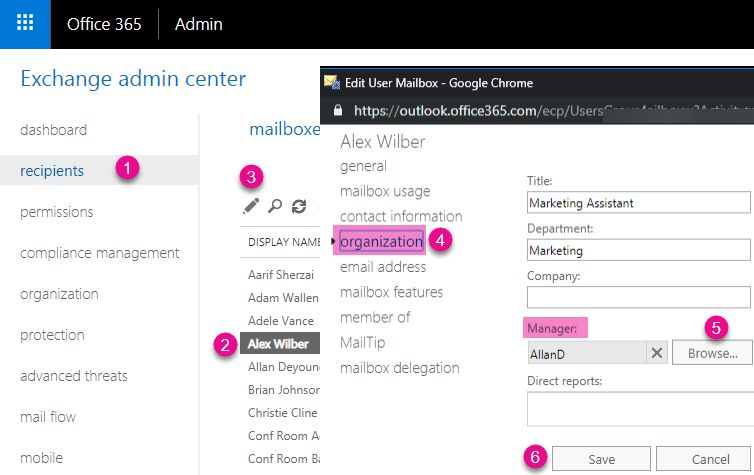 In the left navigation, expand Admin centers, and then select Exchange. In the Exchange Administration Center (EAC), navigate to recipients > mailboxes. Select required user to update manager field and then click on Edit icon. In Edit Uer Mailbox popup, go to organization tab and you can set manager field as shown in below image. Follow the below steps to configure manager from Azure AD Portal. Go to Azure AD Portal. In the left navigation, click Azure Active Directory and click Users. Select (click on user name hyperlink) required user, click on Edit under Job info section and then add or remove manager field as shown in below image. Powershell is always a good tool for Administrators to manager Azure Ad objects. We can use the Azure AD powershell cmdlet Set-AzureADUserManager to set manager field and Remove-AzureADUserManager to remove manager. You can run following command to add manager after replacing required user’s and manager’s UPN or ObjectId. You can run following command to remove or clear manager field. You can check and get users' existing manager value by running following command. Note: Setting up manager field in one place does not immediately reflect in other places or in Delve and you have to wait few mins to hours for a full crawl of Active Directory by the SharePoint User Profiles.